The galleries have been redesigned; you may be able to tell that the site isn’t hig h-spec when it comes to slideshows and whatnot. That’s because I have no website knowledge other than what I’ve learnt whilst putting this site together. So, I like to keep it simple. With this in mind I’ve re-styled the galleries as simple webpages with photos tabled and noted. On each page you can open up each picture for a larger but manageable version. I hope the simplicity makes the galleries easier to navigate than before. A plus is that the collection now shows up in a Google image search, which it hadn’t done previously. I’ve also tried to separate the gallery into useful sub-sections, so you can find all of the images relating to Luise’s Oscar appearances together, a collection of Press images from random events together, and stills from each film neatly packaged on one page, for example. Some of the formatting looks a bit skew-whiff but I’ll work on that as I go along. I am particularly excited about the new gallery for 1935’s Escapade. I was lucky enough to purchase a number of stills from the film recently and these have been put on-line for the first time; as a researcher I know I haven’t seen many of these before, and without the actual film available to view these are the next best thing. They include photos of Luise and her co-stars William Powell, Mady Christians, Virginia Bruce, Henry Travers, Frank Morgan and Mathilde Comont. 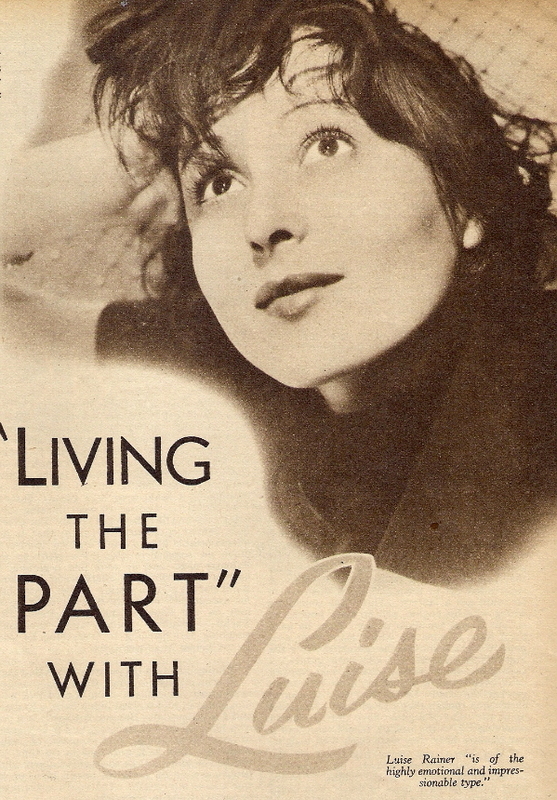 There are also new additions to the ‘Magazines’ section of the site (now renamed as ‘Archive’): the earliest article from a British film magazine in my collection is The Romance of Luise Rainer by Leonard Wallace (from Film Weekly, 1935). I’ve also recently added this review of The Great Ziegfeld from the same magazine in 1937, and this interesting character piece on Luise and Clifford Odets, “Living the Part” with Luise by Jack Chandler, taken from a 1938 edition of Picturegoer. The archive section has also been updated with links to a couple of obituaries and recent articles of interest that have appeared online. I will continue to work through my personal collection of material and add updates to the site as and when I get the chance. I hope that there is enough interesting material to keep readers entertained and educated.